Moonlight Air Organization hasn't added a story. HELP US TO KICKSTART MOONLIGHT AIR ORGANIZATION. YOUR DONATION HELP US TO COVER THE SET UP COST AND TO GET OFF THE GROUND AND IN THE AIR! Für Deutsch klicken Sie bitte hier. When a disaster occurs, the delivery of relief supplies is often delayed and inadequate. Transport of food, appliances and medicine is difficult (due to customs clearance and logistics) and expensive. About 25% of goods are lost during transport due to damage or theft. Transport of goods by sea and land take weeks, even by air transportation it takes several days today (as happened in Haiti 2010, Haiti 2014 or Puerto Rico 2017), therefore help arrives where it is urgently needed only in bits and pieces, uncoordinated and with long delays. The high costs mean that only large organizations can afford to transport supplies by air (as it costs several hundred thousand US dollars per flight), which is why many organizations no longer provide aid, even if they are able to. Also transport by trucks and ships cost several 100’000 dollars each year. Doctors who perform operations in developing countries under adverse conditions are also constrained by the limits of their environment: equipment goes missing, the conditions are unhygienic, and the local staff frequently have only rudimentary training or no training at all. Help is urgently needed in the field of emergency aid and that need will only increase, as the number of natural disasters is continually growing. When it comes to saving as many lives as possible after a disaster, every minute counts. Instead of delivering the necessary relief supplies directly to the disaster site, relief organizations currently have to search for commercial companies that have the necessary transport capacity or available aircraft. It often takes two or three days before the supplies can be loaded on to the aircraft and delivered where they are needed – time that is not available in these situations. We connect a wide range of organizations, pool international synergies, optimizes the aid provided and improves the situation on the spot in a direct way. We transport mobile hospital units and enable doctors to carry out eye, heart and other surgeries in the area without a reliance on local equipment. Together with partners, we are able to construct drinking water supplies, schools, hospitals and houses, and providing agriculture / farming and other material. All with the reason to stimulate the local industry for a sustainable humanitarian aid. Moonlight Air Organization supporting charities with global air transportation mission which are more efficient and ecological because we use biofuel whenever possible and transport up to 100 tons of aid material per flight. Your donation covers all transportation costs with our cargo airplane and at the same time you help relief organizations to use their own donation in a more focused way. Because we offer all flight missions free of charge for humanitarian organizations, they are able to re-invest their own donation into aid material. That means we can transport way more aid material and multiply the effect of aid and support in an area of crisis. This is the largest and most unique project ever made by humans for humans. Help us to make a meaningful difference in the lives of all of us. Together we can save more lives faster - when every second counts. 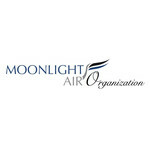 Moonlight Air Organization hasn't posted any updates yet. Moonlight Air Organization is managing the funds for this campaign.